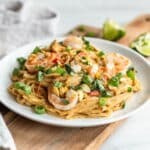 Here are my best tips for making easy meals for dinner that are quick (and sometimes even healthy). We hear it all the time, we know it’s a good idea, but then we forget all about it. But seriously, if you’re roasting a chicken for Sunday dinner, cook an extra one alongside it. 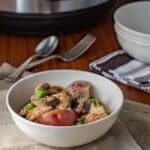 You get your delicious Sunday roast and then you get luscious roast chicken meat to use in easy meals for dinner during the week. 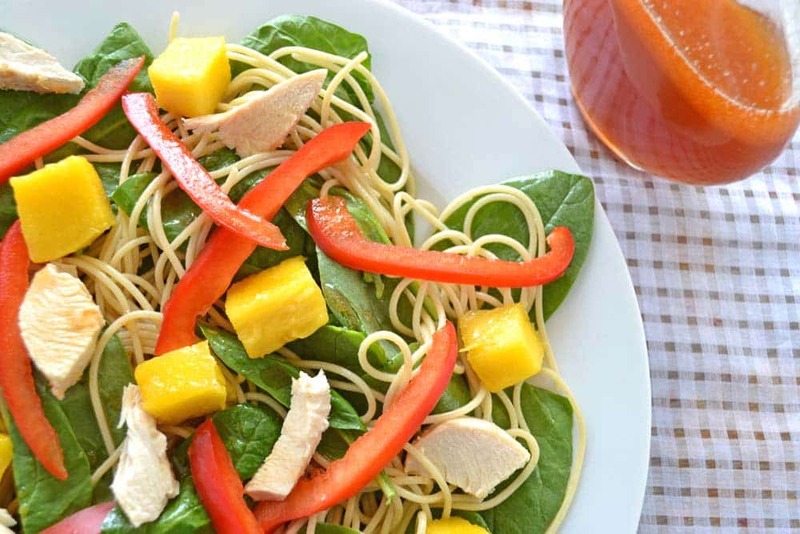 You can toss the roast chicken with pasta on Monday, serve it with sautéed onions and peppers in fajitas on Tuesday and mix it with fresh spinach leaves for the quickest dinner of all, a great Wednesday dinner salad like this one that uses leftover spaghetti noodles, chicken, mango, red peppers and a quick spicy sriracha dressing (serve the dressing on the side so spice-haters can leave it off). Use quick-cooking (or no-cook) ingredients. Proteins: Shrimp cook super-quickly. Smoked salmon doesn’t need to be cooked at all. Canned beans are always a great choice. Carbohydrates: Try quick-cooking barley and tiny potatoes that roast/boil/steam up in flash; fresh pasta noodles cook more quickly than dried as do smaller shapes like alphabets, macaroni and orzo. 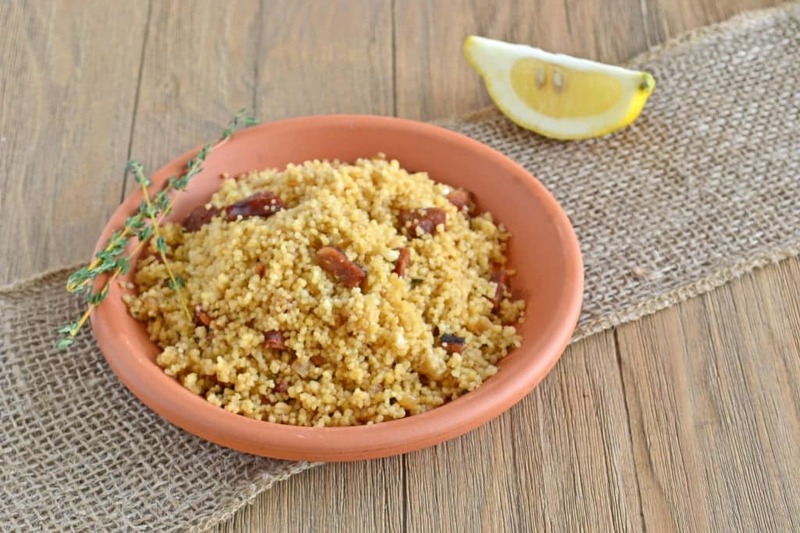 Couscous is hyper-fast as is quinoa and bulgur wheat. Veggies: Remember that you can serve raw veggies at dinner time. Sliced raw carrots, cucumbers, celery, tomatoes, cherry or grape tomatoes, broccoli and cauliflower florets, sugar snap peas, mushrooms and zucchini wedges are all deliciously simple choices. Use a squirt of lemon juice and an olive oil drizzle to flavor them or serve a salad dressing as a dip. I also love to put a handful of raw spinach and/or arugula under pasta or potatoes. The nutrient-packed leaves need no prep. They wilt slightly from the heat of the noodles and add an extra element to your dinner with no work at all. 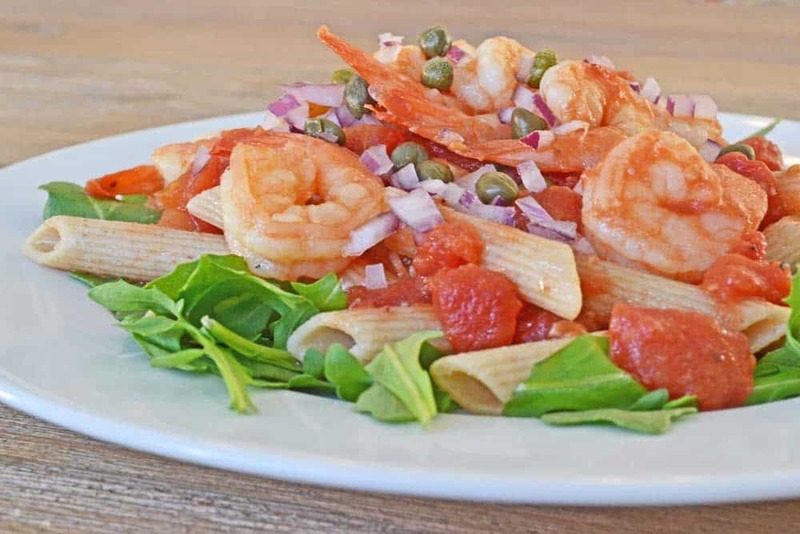 Try this quick shrimp dinner. The toppings are uncooked and served on the side so everyone can choose what they’d like on their pasta dinner. Focus on a single side dish. Here’s the plan: Get some chicken breasts and some green beans. While the oven preheats to 400ºF season everything with salt, pepper and a touch of oil. Put it all onto a large pan and into the oven for 25 minutes, until the chicken is cooked through and the beans are tender. Voilà! An otherwise boring dinner transformed. See, I’ve totally got you covered when it comes to easy meals for dinner this week! Choose the oven over the stove top. After a crazy day the last thing I want to do is stand in front of the stove stirring and checking things. Instead, I turn the oven up high, pile the food onto a big pan, get it in there and walk away. I then have time to check email, fold laundry, play with my kids, sip on a cup of tea while reading a magazine or even sit down with my husband and talk about the day. 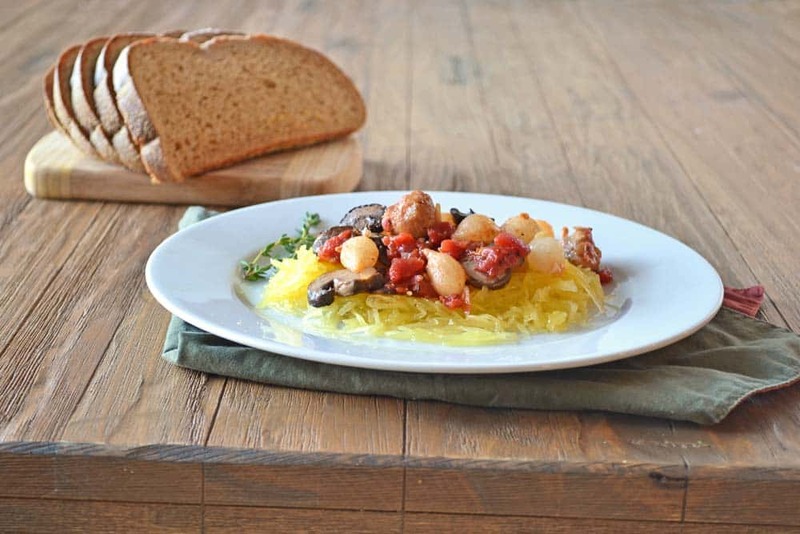 This Oven-Roasted Sausage, Tomatoes and Pearl Onions on Spaghetti Squash is such a simple recipe and, the best part, it becomes delicious with very little work from me. O.K., I’ll admit that setting a timer seems to be adding a touch of unsimplicity. However, when your goal is to get things done in the kitchen so you can sit down with your family and move on with the evening, the timer is your best friend. Figure out how long you think the meal should take you to make, set the timer and go. This timer will stop you from wasting time and will get that dinner onto the table lickety split. Here’s my favorite quick dinner. 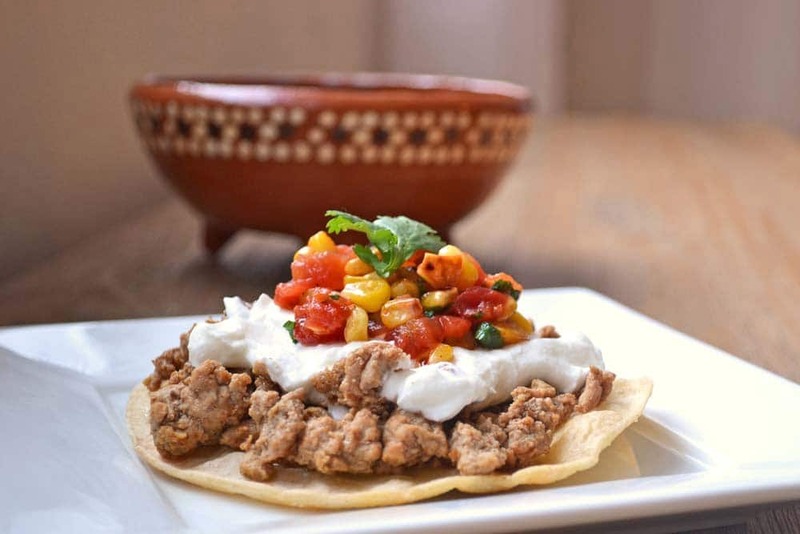 It’s for Chicken Tostados with Homemade Toasted Corn Salsa. I set a timer so that I don’t start making a million different toppings (although, let me say that if there *is* a minute left on the timer I will spend it mashing up an avocado and shredding some cheddar cheese). Be on the look out for easy (and sometimes even healthy) ways to succumb to your cravings. On busy stressful days I want nothing more than a big slice (or two) of gooey pizza. But I can’t very well go ordering delivery twice a week. Instead, I look for simple and comforting yet healthy alternatives. On those days, to help me resist the urge to call for delivery, I try to find other comforting solutions like breakfast-for-dinner (a veggie-packed omelet with oozing brie) or even some chunks of cheese, bread, red pepper jelly and a big crunchy salad. Super-comforting, easy and healthy is this Gallo Pinto from Seasonal and Savory, which I now make at least once every two weeks. Polenta is one of those stick-to-your-ribs kinds of foods. When I load it up with cheddar cheese, I know I’m going to be satisfied. 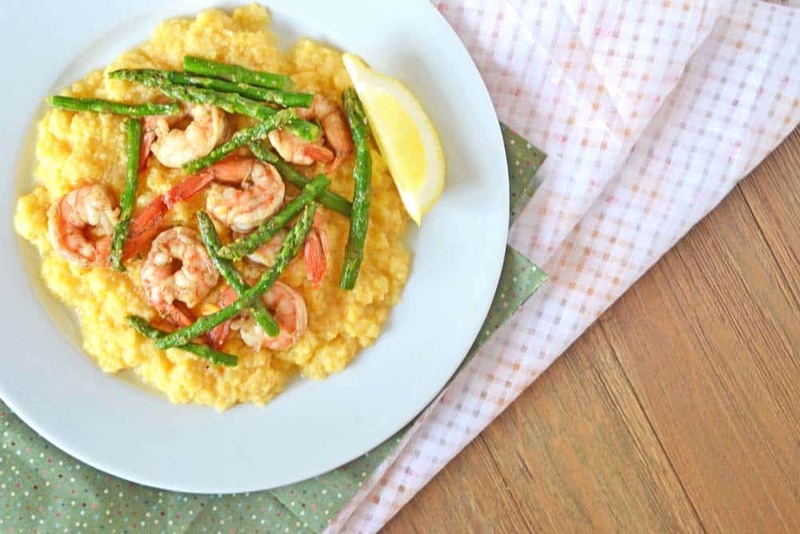 Best of all, it only takes about 10 minutes to make, like in this comforting twist on Shrimp and Grits: Shrimp with Cheddar Polenta and Asparagus. Cook foods that will wait for you. The hardest thing (to me) about cooking for my family is that I can’t seem to get them to all sit down when dinner’s ready. Either there’s a diaper emergency that needs to be dealt with or a pre-schooler who isn’t convinced that play time is over or a husband who needs to send one more email. More than once I’ve been dismayed to sit down with everyone 20 minutes after dinner was ready. 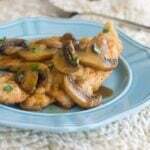 I’m then so unhappy with the results: Dry chicken breasts, cold spaghetti, mushy vegetables. Some things just don’t take well to sitting around. Chicken thighs will stay moister than chicken breasts if they have to sit in the oven for a few extra minutes. Roasting veggies instead of steaming or boiling gives you a few minutes more flexibility. Remove rice or mashed potatoes from the heat and top them with a lid to keep them warm for well over 10 minutes. Toss noodles with a bit of oil if you think they’ll have to sit for long. This prevents sticking. Pouring some boiling water over them just before serving will re-heat them. Here’s a dinner that is all cooked in the oven and that will wait for you if you’re not ready when it is. Interestingly, it uses salmon which is not normally a patient protein. However, the method of cooking (you start with a hot oven and then turn it right off halfway through cooking) yields perfectly cooked salmon that is happy to wait in a warm oven for a few minutes while you round up the family. Before going to the grocery sit down for 20 minutes and sketch out what you’re going to make over the next few days. Think about simple entrees and more interesting side dishes. 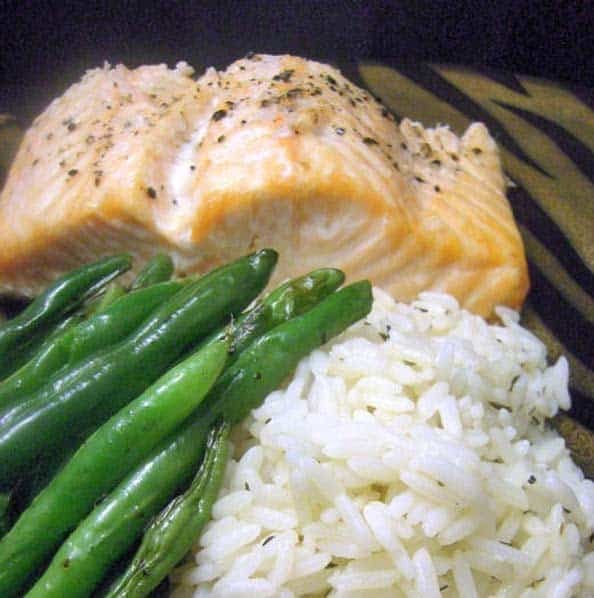 Think about quick-cooking and no-cook foods. Think about meals that you know how to cook quickly so you can set a timer and know that dinner will be done in a flash. Think about foods that you can cook in the oven rather than those that you need to attend to on the stove top. Think about adding some comfort to your meals so that you won’t be tempted to turn to delivery or fast food. Think about foods that are o.k. if not served immediately when they’re ready. Having a plan will make grocery shopping easier and it will make cooking easy meals for dinner so much simpler. 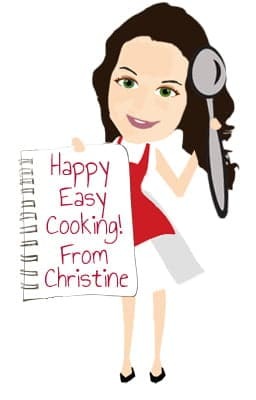 Now head on down to the comments below and tell me your best tips for quick and easy weeknight meals? Disclosure: This post from my archives is being re-run as part of BlogHer’s Smart Mom’s Guide to Being Busy editorial series, brought to you by Rice Krispies and BlogHer. When possible, I try to prep things in the morning before I go to work: chop the vegetables, measure out ingredients for marinade/sauce…that helps me put things together quickly once I start cooking.